Identification of polymorphic genes regulating inflammatory diseases may unravel crucial pathogenic mechanisms. Initial steps to map such genes using linkage analysis in F2 intercross or backcross populations, however, result in broad quantitative trait loci (QTLs) containing hundreds of genes. In this study, an advanced intercross line in combination with congenic strains, was used to fine-map Eae18 on rat chromosome 10 in myelin oligodendrocyte glycoprotein-induced experimental autoimmune encephalomyelitis (EAE). Myelin oligodendrocyte glycoprotein-induced EAE is a chronic relapsing disease that closely mimics key features of multiple sclerosis. Congenic DA.ACI rat strains localized Eae18 to an ∼30-Mb large region. Fine-mapping was then performed in an advanced intercross line consisting of a (DA × PVG.1AV1)F7 intercross, resulting in two adjacent EAE-regulating QTLs designated Eae18a and Eae18b. The two QTLs span 5.5 and 3 Mb, respectively, and the 3-Mb Eae18b contains as few as 10 genes, including a cluster of chemokine genes (CCL1, CCL2, CCL7, and CCL11). Eae18a and Eae18b are syntenic to human chromosome 17p13 and 17q11, respectively, which both display linkage to multiple sclerosis. Thus, Eae18 consists of at least two EAE-regulating genes, providing additional evidence that clustering of disease-regulating genes in QTLs is an important phenomenon. The overlap between Eae18a and Eae18b with previously identified QTLs in humans and mice further supports the notion that susceptibility alleles in inflammatory disease are evolutionary conserved between species. Multiple sclerosis (MS)3 is a chronic inflammatory, demyelinating disease of the CNS that is the leading cause of nontraumatic neurological disability among young adults in the western world. There is solid evidence for polygenic control of the risk and the disease course of MS (1). Identification of gene polymorphisms altering the susceptibility to disease will contribute to the development of prevention and therapy. Unfortunately, efforts using linkage analysis have as yet failed to identify disease regulating non-HLA genes in MS (2, 3, 4, 5, 6, 7, 8, 9, 10, 11, 12). Difficulties arise from genetic heterogeneity, insufficient sample sizes, and small effects of each disease-regulating gene. Positional cloning of genes in experimental models of MS may circumvent some of these difficulties. To reveal mechanisms of importance for human disease, we argue that the used experimental model should closely mimic its human counterpart. We have therefore established myelin oligodendrocyte glycoprotein (MOG)-induced experimental autoimmune encephalomyelitis (EAE) in the rat. MOG-EAE is a chronic relapsing disease with a lesion pathology that very closely resembles the common histopathological form of MS (13, 14, 15). The DA rat strain is susceptible, whereas the PVG.1AV1 and ACI strains are MHC haplotype-identical MOG-EAE-resistant strains (16). This establishes an experimental system that allows mapping of disease-regulating non-MHC genes in an unbiased way (17). We here report the first application of an advanced intercross line (AIL) in the genetic dissection of a complex experimental inflammatory disease. To date, gene mapping in rodent inflammatory diseases has relied on whole genome scans in backcross or F2 populations followed by fine-mapping in congenic strains. Although ∼35 quantitative trait loci (QTLs) regulating rodent EAE have been identified with this approach (17, 18, 19, 20, 21, 22, 23, 24, 25, 26, 27, 28, 29, 30, 31), there are certain limitations. Confidence intervals in F2 crosses are typically ∼20 cM and contain, on average, as many as 500 genes. Further complications using linkage analysis in F2 populations are: 1) a single QTL may comprise several adjacent QTLs (32, 33); 2) nearby QTLs with opposing effects may not be detected (34); and 3) a detected QTL may be incorrectly positioned (33, 35). Congenic mapping may provide formal evidence for the role of a particular gene, although it requires laborious testing because initially even a larger fragment than the one representing the F2 confidence interval is introduced into the recipient background genome (36). High resolution QTL mapping can instead be achieved using an AIL. An AIL is created by random intercross breeding of two inbred strains for several generations, resulting in genetically unique individuals with a mixture of founder chromosomal fragments. The increase in recombinations increases the genomic resolutions, which allows separation of linked QTLs, given that t (t = number of generations) is large enough (35). Furthermore, the relative distance between recombinations is 100/t cM; thus, the AIL theoretically gives at least a t/2-fold reduction in the confidence interval compared with a F2 cross (35, 37). The estimation of the QTL localization will therefore be considerably improved. Our interest in the region on rat chromosome 10, hereby designated Eae18 (http://ratmap.gen.gu.se/), stems from previous observations of linkage to MOG-EAE (17). We have demonstrated that a rat congenic strain with a large ACI chromosome 10 fragment (∼50 cM, corresponding to ∼60 Mb) introduced into the susceptible DA background conferred protection from MOG-EAE (38). In the present study, we reduced the size of Eae18 in recombinant DA.ACI congenic strains. Eae18 was then resolved into two narrow QTLs using an F7 (DA × PVG.1AV1) AIL. Full length (DA.ACI-D10Rat2-D10Rat29) congenic animals were established using a speed congenization approach (38). They were then intercrossed with parental DA rats to create heterozygous animals that were subsequently intercrossed to obtain recombinations within the region. Rats with recombinations were made homozygous before experiments. The following recombinant strains were tested in MOG-EAE (Fig. 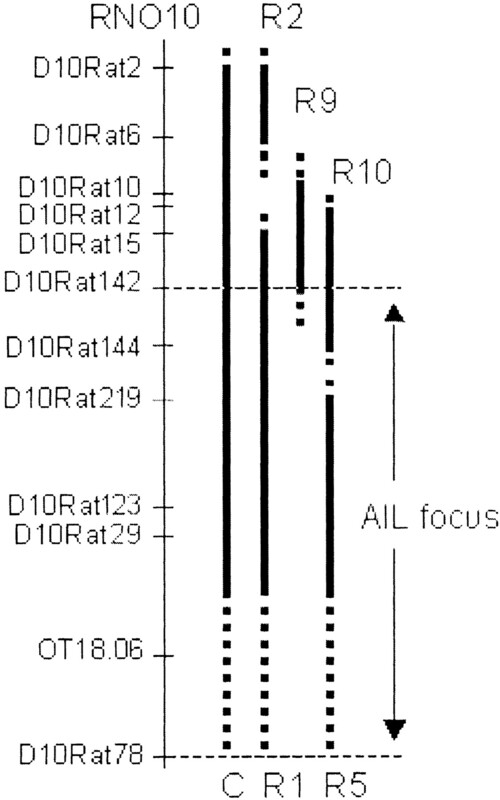 1⇓): R1 (DA.ACI-D10Rat15-D10Rat29) and R2 (DA.ACI-D10Rat2-D10Rat6) that did not overlap, R9 (DA.ACI-D10Rat10-D10Rat142) that covered the region between R1 and R2 overlapping with both, R10 (DA.ACI-D10Rat12-D10Rat144) that overlapped with R1 and R9 and finally R5 (DA.ACI-D10Rat219-D10Rat29) that covered the central ∼15 cM (∼30 Mb) large chromosome 10 fragment of the R1 recombinant. Between 7 and 16 male rats were used in each experiment. Genetic map of rat chromosome 10 (RNO10) aligned with chromosomal regions interposed in congenic recombinant strains. Thin vertical line, rat chromosome 10 along with microsatellite markers placed according to a relative scale based on Mb positions derived from the rat genome sequence (http://www.ensembl.org); thick vertical lines, different congenic recombinant strain intervals transferred from ACI onto the DA strain background; dashed lines, the flanking regions within which recombinations have occurred. Recombinant congenic strains that displayed protection from EAE were C (full length congenic), R1, and R5. R10 displayed an intermediate phenotype, whereas R2 and R9 did not differ from the parental DA strain. Horizontal dotted lines, chromosomal interval subjected to fine-mapping in the (DA × PVG.1AV1)F7 AIL. The peak markers for Eae18a and Eae18b were OT18.06 and D10Rat123, respectively. The AIL originated from EAE-susceptible DA and EAE-resistant PVG.1AV1 rat strains that share the RT.1AV1 MHC haplotype, thus allowing identification of non-MHC genes. One important reason for choosing the DA/PVG strain combination was to permit dense genotyping, because these strains display a high rate of polymorphic microsatellite markers, ∼60% according to the Whitehead Institute (http://www.genome.wi.mit.edu/rat/public/). To create the F1 generation, two breeding pairs with DA female founders and two breeding pairs with PVG.1AV1 female founders were bred. The F2 generation was produced from seven couples each of F1 rats with DA and PVG.1AV1 as female founders, respectively. The F3 generation originated from 50 breeding couples with both types of female founders. Random breeding of 50 males and females, consistently avoiding brother-sister mating, produced all subsequent generations. Thereafter, three F7 litters were produced for MOG-EAE experiments. The litters were similar in size and contained almost equal numbers of females and males. Inbred DA (Dark Agouti) and PVG.1AV1 rats were originally obtained from Zentralinstitut für Versuchstierzucht (Hannover, Germany). Rats were bred and kept at the Karolinska Hospital (Stockholm, Sweden) in a 12-h light/dark cycle, housed in polystyrene cages containing aspen wood shavings and with free access to water and standard rodent chow. They were routinely tested for specific pathogens according to a health-monitoring program for rats at the National Veterinary Institute in Uppsala, Sweden. The local ethical committee in Northern Stockholm approved the experiments. Recombinant rat MOG (aa 1–125 from the N terminus) was expressed in Escherichia coli and purified to homogeneity by chelate chromatography (39). Rats were anesthetized with isoflurane (Forene; Abbott Laboratories, Abbott Park, IL) and immunized by a single intradermal injection in the dorsal base of the tail with 200 μl of inoculum containing rMOG in saline emulsified (1:1) with IFA (Sigma-Aldrich, St. Louis, MO). Rats were weighed and monitored daily for clinical signs of EAE, from day 10 until day of sacrifice at day 31–40 postimmunization (p.i.). Serum for anti-MOG IgG assessment was collected on day 12 p.i. The clinical scoring was: 0, no clinical signs of EAE; 1, tail weakness or tail paralysis; 2, hind leg paraparesis or hemiparesis; 3, hind leg paralysis or hemiparalysis; 4, tetraplegy or moribund; and 5, death. The rMOG dose used for disease induction in the congenic mapping experiments was 15, 20, or 70–80 μg/rat, depending on the batch of rMOG protein, and 40 μg for AIL animals. The dose was selected upon titration in the susceptible parental DA rats. Age-matched rats between 9 and 15 wk of age were used in all experiments. A total of 152 clinically affected rats and 162 randomly selected unaffected rats were genotyped. Affected animals were selected on the basis of displaying unambiguous signs of the disease (minimum score 1 for >2 days accompanied with weight loss). Rats in the unaffected group did not display any signs of disease, including a steady increase in weight. DNA was extracted from the tail tip according to a standard protocol (40). The region analyzed in the AIL covered the fragment in the R5 congenic strain and the centromeric fragment of the R10 congenic strain (Fig. 1⇑). Both of these fragments displayed phenotypic differences. The fragment in the R9 congenic strain did not display any phenotypic differences and therefore the telomeric part of the R10 fragment, which overlaps with the R9 fragment, was not included in the AIL analysis (Fig. 1⇑). The 35-cM (50 Mb) large region, extending from D10Rat78 to D10Rat142, was genotyped with 56 microsatellite markers (<1 cM spacing in average) (GENSET, Paris, France). Primers for additional microsatellite markers within the region were designed using Oligo version 5.0 (National Biosciences, Plymouth, MN). The following primers were used: MJ082 (forward 5′-AGAGACCAGACAGACTTTAAT; reverse 5′-TGTACGTGTGGTACGTAAATA); MJ411 (forward 5′-GCATCTGTATTCATATTT; reverse 5′-TATACATGTTTCACTGCAAAT), MJ770 (forward 5′-AGTAATTGCTGTCCTTTTCT; reverse 5′-GGATCAACAATTTTGAAAGT); MJ546 (forward 5′-TTTGCTCTTCAGGTCTAGTA; reverse 5′-TCCTCCATGTCTTATTTGTA) and MJ310 (forward 5′-GATCTCTGTAGTCCCATAAAT; reverse 5′-GGAAAATAGAGACTTAGAGAA). PCR amplification was performed as previously described (41) with [γ-33P]ATP end-labeling of the forward primer. The PCR products were size fractionated on 6% polyacrylamide gels and visualized by autoradiography. All genotypes were evaluated manually and double-checked. The map, defined using the publicly available rat genome sequence (http://www.ensembl.org/), corresponded to the linkage map of the present data generated using MAPMAKER/EXP. Accordingly, the marker order from the physical map was applied, and linkage analysis was performed using R/qtl software (42). Data were analyzed implementing the nonparametric model for maximum EAE score, cumulative EAE score, duration and onset of EAE, and the binary model for incidence of EAE. Permutation tests using R/qtl were performed to determine the threshold levels for significant linkage. The permutation procedure based on the investigated material is empirical and reflects the characteristics of the particular experiment to which it is applied (43). To further evaluate the identified QTLs, we have implemented a multiple QTL model test using R/qtl software. This analysis is based on the creation of an initial model of phenotypic variance, comprising all identified QTLs displaying significant linkage. Each QTL is then excluded from the initial model in subsequent steps, and the influence on the phenotypic variance by the excluded QTL is estimated. The outcome of the multiple QTL model analysis therefore provides information on whether certain QTL has a significant effect on the phenotype (p ≤ 0.05) or not (p > 0.05). The region was also tested for epistatic interactions by implementing a two-dimensional scan with a two-QTL model using R/qtl (42). The results were confirmed by nonparametric pointwise analysis (JMP, 4.0.2; SAS Institute, Cary, NC). Fisher’s exact test was used to analyze whether there was a difference in the observed genotype distribution between affected and unaffected rats. The Kruskal-Wallis ranking test was used to analyze whether different genotypes were associated with maximum EAE score, cumulative EAE score, duration of EAE, onset of EAE, and anti-MOG Ab levels, respectively. The analysis using R/qtl and MAPMAKER/QTL resulted in similar levels of significance and peak intervals (44). We therefore present the outcome of R/qtl alone, because this software was used to determine the significance levels using permutation tests, for the fit-multiple QTL model and for the analysis of epistatic interactions. Blood samples for Ab measurement were collected at day 12 p.i. ELISA plates with 96 wells (Nunc, Roskilde, Denmark) were coated with 10 μg/ml rat recombinant MOG diluted in 0.1M NaHCO3 (100 μl/well) and stored overnight at 4°C. Plates were washed with PBS, 0.05% Tween 20, and free binding sites were blocked with 5% fat-free milk in PBS, 0.05% Tween 20 for 1 h at room temperature. After washing, diluted serum samples were added in duplicates and incubated for 1 h at room temperature. Plates were washed and incubated for 1 h at room temperature with rabbit anti-rat IgG, IgG1, IgG2b, or IgG2c (Nordic, Tilburg, The Netherlands). Unbound Abs were removed by washing before addition of a peroxidase-conjugated goat anti-rabbit antiserum (Nordic) diluted in PBS, 0.05% Tween 20 (1/10,000). After 30 min of incubation, plates were washed extensively, and bound Abs were visualized with 3,3′,5,5′-tetramethylbenzidine (Sigma-Aldrich). The reaction was stopped by addition of 1 M HCl after 15 min in darkness and OD was read at 450 nm. Nine 2-fold dilutions in duplicates of serum containing high levels of anti-MOG IgG were included on each plate to construct a standard curve and to permit interplate comparisons. Levels were presented in arbitrary units deduced from the standard curve. A DA.ACI -D10Rat2-D10Rat29 congenic rat strain in which the inserted ACI congenic fragment is ∼50 cM (60 Mb) reproducibly demonstrated protection against MOG-EAE (38). Congenic dissection of recombinant strains demonstrated that clinical EAE features differed between the full length congenic and the recombinant R1 and R5 strains compared with the parental DA strain (Table I⇓ and Fig. 1⇑.) The difference in clinical EAE signs varied between experiments, but the full length congenic and the recombinant R1 and R5 strains consistently displayed lower mean cumulative scores compared with the susceptible DA parental strain (Table I⇓). In contrast, R2 and R9 did not differ from the parental DA strain (Table I⇓). The absence of any up- and/or down-regulatory effects in the R2 and R9 recombinant congenic strains strongly argues against effects by contaminating ACI genes outside the congenic fragment. The R10 strain displayed an intermediate phenotype in a single experiment and would need further testing before concluding additional gene regulatory influences from this region (Table I⇓). We have thus isolated and narrowed down a 50-cM (60-Mb) large MOG-EAE-regulating region to a 15-cM (30-Mb) region present in R1 and R5, but not in R2 and R9. A total of 1068 MOG immunized F7 rats were examined for clinical EAE signs for 31 days p.i. (Table II⇓). Clinical signs defined as a minimum of 2 days of EAE score 1 (tail paralysis) were recorded in 14.8% of animals (158 of 1068). Affected animals displayed different degrees of severity and a variety of disease courses (i.e., monophasic, relapsing-remitting, and chronic progressive EAE). The disease course could not be determined unambiguously due to a late onset in a subgroup of 33 rats. An additional group of 92 animals displayed minor disease signs with tail tip paralysis, ragged fur, weight loss, or arrested weight gain. These signs may potentially reflect a subclinical disease. We therefore excluded this group from genetic analyses, because it was not possible to separate them from the healthy rats using the current EAE scoring scale. Linkage analysis resolved the R5 region into two highly significant QTLs, Eae18a and Eae18b, displaying linkage to all clinical EAE phenotypes (Fig. 2⇓). The LOD levels for significant linkage generated with 5000 permutations were 2.4 for incidence of EAE and duration of EAE and 2.5 for maximum EAE score, cumulative EAE score, and onset of EAE. The 95% confidence interval was defined as a drop in LOD of 1 (45). Furthermore, the Eae18a and Eae18b intervals are supported by multiple markers: 13 microsatellite markers in Eae18a and 10 in Eae18b. Log-likelihood plot of Eae18a and Eae18b identified in the (DA × PVG.1AV1)F7 AIL. Eae18a and Eae18b that regulate MOG-EAE displayed significant linkage to all clinical EAE phenotypes: cumulative EAE score; maximum EAE score; incidence of EAE; duration and onset. The markers in the region are listed on the x-axis (R, D10Rat; A, D10Arb; W, D10Wox; G, D10Got; MG, D10Mgh). Eae18a is 5.5 Mb and contains 40 confirmed rat genes; Eae18b is 3 Mb and contains 10 confirmed rat genes. The QTL size is calculated using the rat sequencing data on http://www.ensembl.org. The human syntenic regions for Eae18a and Eae18b are indicated with red and blue bars below the plot. Eae18a is syntenic to the human 17p13.1-p13.2 and Eae18b to the human 17q11.2-q12 region. The genes within the Eae18b were retrieved from the rat physical map on http://www.ensembl.org and are shown below the bars for the syntenic human regions. Bold text and black bars indicate confirmed rat genes. Italicized text and gray bars indicate predicted rat genes. The first QTL, Eae18a, displayed maximum LOD scores in the range of 5.8–7.5 for the different EAE phenotypes. The confidence interval spans from D10Wox13 to OT90.48, comprising a ∼5.5-Mb-large region. The DA allele at the peak marker (OT18.06) is disease-enhancing in an additive manner. Sequence alignments and map comparisons (http://www.ensembl.org/) revealed that Eae18a is syntenic to human 17p13.1-p13.2 (Fig. 2⇑ and Table III⇓). The second QTL, Eae18b, displayed maximum LOD scores of 4.5–5.8 for the EAE phenotypes. The confidence interval spans from D10Rat243 to D10Rat58, and the region is ∼3 Mb. The DA/PVG allele distribution tested for the peak marker (D10Rat123) suggests a recessive DA allele disease-promoting effect. Eae18b is syntenic to the human chromosome 17q11.2-q12 region (Fig. 2⇑ and Table III⇑). A summary of all genes residing within Eae18b is presented in Table IV⇓. The multiple QTL analysis confirmed the existence of Eae18a and Eae18b as two separate QTLs regulating EAE phenotypes. Accordingly, p values of 0.0004 and 0.03 were obtained when excluding Eae18a and Eae18b, respectively, for maximum EAE score (as described in Materials and Methods). The multiple QTL model also displayed significance when testing Eae18a and Eae18b for incidence of EAE, cumulative EAE score, duration of EAE, and onset of EAE (p ≤ 0.05). This test confirms a regulatory effect of Eae18a and Eae18b on EAE phenotypes. The third peak displaying LOD scores above the threshold for significance did not fit in the multiple QTL model described (p > 0.05). Moreover, it was supported by only one microsatellite marker (D10Rat81) and may therefore be a false positive. In addition, we wanted to evaluate any possible gene interactions within this region. However, no significant epistatic interactions were detected between Eae18a and Eae18b, or any other two positions within the tested region, when using a two-dimensional scan with a two-QTL model (using R/qtl; data not included). In addition to the clinical EAE phenotypes, we assessed the anti-MOG autoimmune response by measurement of anti-MOG Ab levels in serum. 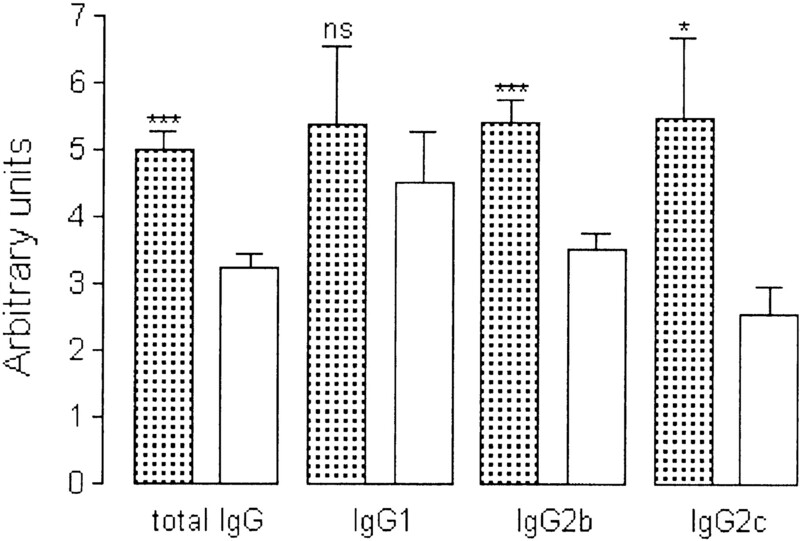 Clinical disease was associated with elevated levels of total anti-MOG IgG, IgG2b, and IgG2c isotype levels, whereas there was no correlation with IgG1 isotype levels (Fig. 3⇓). Nonetheless, Eae18a and Eae18b did not display any linkage to total anti-MOG IgG or to anti-MOG IgG1, IgG2b, or IgG2c isotypes when performing linkage analysis (data not included). Serum anti-MOG Ab levels day 12 p.i. measured with ELISA in 305 AIL (DA × PVG.1AV1)F7 rats. ▦, Affected animals; □, unaffected animals. Arbitrary units were deduced from a standard curve of nine 2-fold dilutions of sera with anti-MOG Abs (mean ± SEM). Differences between affected and unaffected rats for each isotype were tested using the Mann-Whitney U test; ∗, p < 0.05; ∗∗∗, p < 0.001. To assess the average genome fragment size inherited from parental strains in the AIL F7 generation, we randomly selected 20 F7 rats and determined the fragment size in an ∼50-Mb-large region on rat chromosome 10 in rats that contained at least two recombinations within this region. The average fragment size was ∼13 Mb, corresponding to ∼9 cM. However, this is an underestimation because 6 of the 20 selected rats carried only one or no recombination, although the fragment size roughly fits the theoretically expected value in the seventh generation, i.e., 14 cM (100/7). We here report the genetic dissection of Eae18 on rat chromosome 10 obtained by an AIL in combination with recombinant congenic strains. In particular, the AIL proved to be a powerful tool for fine-mapping that resolved Eae18 into two narrow, highly significant QTLs. Thus, the AIL approach revealed a complexity not detectable in the previous F2 intercross and not observed by congenic mapping (17, 38). This clearly demonstrates that the QTL regulation of a complex inflammatory disease can derive from more than one closely situated gene. In the limited number of fine-mapping studies reported in other inflammatory diseases such as murine lupus, diabetes, and trypanosomiasis, findings are along the same line (32, 46, 47). It is therefore likely that the less discriminative mapping obtained by F2 intercrosses and backcrosses detect QTLs due to the net effect of closely situated additive genes. Furthermore, such additive effects may result in LOD curves where the peaks do not correspond to any of the multiple disease-regulating genes within the region, thus hampering correct gene localization (33). At present, we cannot estimate how many QTLs have this polygenic nature because so few have yet been fine-mapped. In our study, we combine the AIL and the recombinant congenic mapping approaches. An ∼60-Mb region previously isolated in the DA.ACI congenic strain was narrowed down to ∼30 Mb in the recombinant congenic strain DA.ACI-R5. Further congenic fine-mapping was, however, hampered by the lack of polymorphic microsatellite markers between the DA and the ACI strains, because the polymorphism rate is only ∼10% (17). Furthermore, the lack of polymorphic markers is not evenly distributed within this region but instead covers certain blocks. The DA.ACI-R5 region is one of those, with 3 polymorphic of a total of 70 markers in a 40-Mb region. We therefore currently define polymorphic SNPs to select intraregional recombinant strains. The low degree of polymorphisms between the DA and the ACI strains may, however, also be advantageous, because polymorphisms responsible for phenotypic differences and disease regulation are easier to identify during sequencing of candidate genes. The DA × PVG.1AV1 strain combination provides a substantially higher degree of polymorphism (∼60% according to http://www-genome.wi.mit.edu/rat/public/), which is required for a successful high-resolution mapping in an AIL. Obviously, the use of the DA × PVG.1AV1 strain combination may unravel different genes than those in DA × ACI, although it is highly unlikely that none of the DA disease-promoting genes would be the same. Eae18b was refined to a 3-Mb region, which contains 10 genes, including a cluster of chemokine genes, CCL1, CCL2, CCL7, and CCL11 (Table IV⇑). These genes are particularly attractive candidates in EAE and MS, because chemokines are the most important mediators of leukocyte migration to inflammatory lesions. Blocking of chemokine receptors has been a successful therapeutic approach in EAE and is now also tested in MS (48, 49). Any polymorphism(s) in a certain chemokine gene that can be linked to EAE susceptibility will provide a more specific therapeutic target. Multiple sequence polymorphisms are already identified in mouse CCL1, CCL2, and CCL12 (50). These polymorphisms were suggested to alter the chemokine activity and the capability of binding to tissue matrices. Interestingly, two polymorphisms in the promoter/enhancer region of CCL7 were associated with MS in two case-control studies (51, 52). Sequencing of all genes identified in Eae18b is currently under way in our laboratory. Eae18a was refined to a 5.5-Mb interval, situated within a very gene-dense genome region, consisting of ∼130 genes. A current list of genes located in Eae18a can easily be retrieved using the flanking marker information and the publicly available rat genome map (http://www.ensembl.org). Eae18a contains several relevant candidate genes, such as arachidonate 12/15-lipoxygenase, two translation initiation factors (EIF-4A and 5A), MAPK, and C1q. Both Eae18a and Eae18b display an interesting overlap with loci identified in several human inflammatory diseases and in their experimental counterparts. Eae18b overlaps with two QTLs, which displayed linkage to murine EAE (27, 28, 29, 31). Moreover, Eae18b is syntenic to human 17q11.2-q12, which has displayed linkage to MS in several studies (4, 6, 53). Eae18a overlaps with Eae3 that was identified in an LEW × BN intercross (19). Furthermore, it is syntenic to the human chromosome 17p13.1–17p13.2, which displayed linkage in the British and Australian MS materials (4, 6, 12). The overlap between Eae18a and Eae18b and the regions implicated in human and mouse linkage studies strengthens the approach of comparative genomics. Eae18a and Eae18b also overlap with regions that displayed linkage to other experimental organ-specific inflammatory diseases such as neuritis and arthritis (54, 55). In addition, the syntenic mouse region on chromosome 11B3-B5 has been linked to type 1 diabetes and systemic lupus erythematosus (56, 57), whereas the human 17p13 and 17q11 regions have been linked to rheumatoid arthritis (58, 59). Accordingly, Eae18a and Eae18b are an example of clustering of genes of importance for different inflammatory diseases (60). We conclude that for the first time in the setting of an experimental inflammatory disease, an AIL is successfully used to define two highly significant, closely situated QTLs. The data support that clustering of immunoregulatory genes in QTLs is a rule rather than an exception. Furthermore, we demonstrate synteny between the identified rat MOG-EAE-regulatory QTLs with MS QTLs on human chromosome 17. Eae18b comprises only 10 genes, which makes possible both positional cloning attempts using recombinant congenic strains, expression and sequence polymorphism analysis of the genes within the region, and association studies in large cohorts of persons with inflammatory disease and controls. Interesting candidate genes also emerge from the ∼130 genes located in Eae18a. Positional identification of evolutionary conserved key immunoregulatory genes is crucial for the understanding of the organ-specific chronic inflammatory diseases. We thank Dr. Ingrid Dahlman for participation in the initial breeding of the advanced intercross line and Associate Professor R. A. Harris for linguistic advice. ↵1 This study was supported by grants from the Swedish Research Council, the Wadsworth Foundation, Torsten och Ragnar Söderbergs Foundation, Nils and Bibbi Jenssens Foundation, Montel Williams Foundation, and Astrazeneca R&D. ↵3 Abbreviations used in this paper: MS, multiple sclerosis; EAE, experimental autoimmune encephalomyelitis; LOD, base 10 logarithm of the likelihood ratio; MOG, myelin oligodendrocyte glycoprotein; p.i., postimmunization; QTL, quantitative trait locus. Ebers, G. C., D. E. Bulman, A. D. Sadovnick, D. W. Paty, S. Warren, W. Hader, T. J. Murray, T. P. Seland, P. Duquette, T. Grey, et al 1986. A population-based study of multiple sclerosis in twins. N. Engl. J. Med. 315:1638. Ebers, G. C., K. Kukay, D. E. Bulman, A. D. Sadovnick, G. Rice, C. Anderson, H. Armstrong, K. Cousin, R. B. Bell, W. Hader, et al 1996. A full genome search in multiple sclerosis. Nat. Genet. 13:472. Haines, J. L., M. Ter-Minassian, A. Bazyk, J. F. Gusella, D. J. Kim, H. Terwedow, M. A. Pericak-Vance, J. B. Rimmler, C. S. Haynes, A. D. Roses, et al 1996. A complete genomic screen for multiple sclerosis underscores a role for the major histocompatability complex. Nat. Genet. 13:469. Sawcer, S., H. B. Jones, R. Feakes, J. Gray, N. Smaldon, J. Chataway, N. Robertson, D. Clayton, P. N. Goodfellow, A. Compston. 1996. A genome screen in multiple sclerosis reveals susceptibility loci on chromosome 6p21 and 17q22. Nat. Genet. 13:464. Kuokkanen, S., M. Gschwend, J. D. Rioux, M. J. Daly, J. D. Terwilliger, P. J. Tienari, J. Wikstrom, J. Palo, L. D. Stein, T. J. Hudson, E. S. Lander, L. Peltonen. 1997. Genomewide scan of multiple sclerosis in Finnish multiplex families. Am. J. Hum. Genet. 61:1379. Chataway, J., R. Feakes, F. Coraddu, J. Gray, J. Deans, M. Fraser, N. Robertson, S. Broadley, H. Jones, D. Clayton, P. Goodfellow, S. Sawcer, A. Compston. 1998. The genetics of multiple sclerosis: principles, background and updated results of the United Kingdom systematic genome screen. Brain 121:1869. Dyment, D. A., C. J. Willer, B. Scott, H. Armstrong, A. Ligers, J. Hillert, D. W. Paty, S. Hashimoto, V. Devonshire, J. Hooge, et al 2001. Genetic susceptibility to MS: a second stage analysis in Canadian MS families. Neurogenetics 3:145. Broadley, S., S. Sawcer, S. D’Alfonso, A. Hensiek, F. Coraddu, J. Gray, R. Roxburgh, D. Clayton, C. Buttinelli, A. Quattrone, et al 2001. A genome screen for multiple sclerosis in Italian families. Genes Immun. 2:205. Coraddu, F., S. Sawcer, S. D’Alfonso, M. Lai, A. Hensiek, E. Solla, S. Broadley, C. Mancosu, M. Pugliatti, M. G. Marrosu, A. Compston. 2001. A genome screen for multiple sclerosis in Sardinian multiplex families. Eur. J. Hum. Genet. 9:621. Haines, J. L., Y. Bradford, M. E. Garcia, A. D. Reed, E. Neumeister, M. A. Pericak-Vance, J. B. Rimmler, M. M. Menold, E. R. Martin, J. R. Oksenberg, et al 2002. Multiple susceptibility loci for multiple sclerosis. Hum. Mol. Genet. 11:2251. Akesson, E., A. Oturai, J. Berg, S. Fredrikson, O. Andersen, H. F. Harbo, M. Laaksonen, K. M. Myhr, H. I. Nyland, L. P. Ryder, et al 2002. A genome-wide screen for linkage in Nordic sib-pairs with multiple sclerosis. Genes Immun. 3:279. Ban, M., G. J. Stewart, B. H. Bennetts, R. Heard, R. Simmons, M. Maranian, A. Compston, S. J. Sawcer. 2002. A genome screen for linkage in Australian sibling-pairs with multiple sclerosis. Genes Immun. 3:464. Lorentzen, J. C., S. Issazadeh, M. Storch, M. I. Mustafa, H. Lassman, C. Linington, L. Klareskog, T. Olsson. 1995. Protracted, relapsing and demyelinating experimental autoimmune encephalomyelitis in DA rats immunized with syngeneic spinal cord and incomplete Freund’s adjuvant. J. Neuroimmunol. 63:193. Storch, M. K., A. Stefferl, U. Brehm, R. Weissert, E. Wallstrom, M. Kerschensteiner, T. Olsson, C. Linington, H. Lassmann. 1998. Autoimmunity to myelin oligodendrocyte glycoprotein in rats mimics the spectrum of multiple sclerosis pathology. Brain Pathol. 8:681. Weissert, R., E. Wallstrom, M. K. Storch, A. Stefferl, J. Lorentzen, H. Lassmann, C. Linington, T. Olsson. 1998. MHC haplotype-dependent regulation of MOG-induced EAE in rats. J. Clin. Invest. 102:1265. Dahlman, I., E. Wallstrom, R. Weissert, M. Storch, B. Kornek, L. Jacobsson, C. Linington, H. Luthman, H. Lassmann, T. Olsson. 1999. Linkage analysis of myelin oligodendrocyte glycoprotein-induced experimental autoimmune encephalomyelitis in the rat identifies a locus controlling demyelination on chromosome 18. Hum. Mol. Genet. 8:2183. Dahlman, I., J. C. Lorentzen, K. L. de Graaf, A. Stefferl, C. Linington, H. Luthman, T. Olsson. 1998. Quantitative trait loci disposing for both experimental arthritis and encephalomyelitis in the DA rat: impact on severity of myelin oligodendrocyte glycoprotein-induced experimental autoimmune encephalomyelitis and antibody isotype pattern. Eur. J. Immunol. 28:2188. Roth, M. P., C. Viratelle, L. Dolbois, M. Delverdier, N. Borot, L. Pelletier, P. Druet, M. Clanet, H. Coppin. 1999. A genome-wide search identifies two susceptibility loci for experimental autoimmune encephalomyelitis on rat chromosomes 4 and 10. J. Immunol. 162:1917. Dahlman, I., L. Jacobsson, A. Glaser, J. C. Lorentzen, M. Andersson, H. Luthman, T. Olsson. 1999. Genome-wide linkage analysis of chronic relapsing experimental autoimmune encephalomyelitis in the rat identifies a major susceptibility locus on chromosome 9. J. Immunol. 162:2581. Bergsteinsdottir, K., H. T. Yang, U. Pettersson, R. Holmdahl. 2000. Evidence for common autoimmune disease genes controlling onset, severity, and chronicity based on experimental models for multiple sclerosis and rheumatoid arthritis. J. Immunol. 164:1564. Becanovic, K., E. Wallstrom, B. Kornek, A. Glaser, K. W. Broman, I. Dahlman, P. Olofsson, R. Holmdahl, H. Luthman, H. Lassmann, T. Olsson. 2003. New loci regulating rat myelin oligodendrocyte glycoprotein-induced experimental autoimmune encephalomyelitis. J. Immunol. 170:1062. Sundvall, M., J. Jirholt, H. T. Yang, L. Jansson, A. Engstrom, U. Pettersson, R. Holmdahl. 1995. Identification of murine loci associated with susceptibility to chronic experimental autoimmune encephalomyelitis. Nat. Genet. 10:313. Baker, D., O. A. Rosenwasser, O. N. J. K. , J. L. Turk. 1995. Genetic analysis of experimental allergic encephalomyelitis in mice. J. Immunol. 155:4046. Encinas, J. A., M. B. Lees, R. A. Sobel, C. Symonowicz, J. M. Greer, C. L. Shovlin, H. L. Weiner, C. E. Seidman, J. G. Seidman, V. K. Kuchroo. 1996. Genetic analysis of susceptibility to experimental autoimmune encephalomyelitis in a cross between SJL/J and B10.S mice. J. Immunol. 157:2186. Croxford, J. L., J. K. Oneill, D. Baker. 1997. Polygenic control of experimental allergic encephalomyelitis in Biozzi ABH and BALB/c mice. J. Neuroimmunol. 74:205. Butterfield, R. J., J. D. Sudweeks, E. P. Blankenhorn, R. Korngold, J. C. Marini, J. A. Todd, R. J. Roper, C. Teuscher. 1998. New genetic loci that control susceptibility and symptoms of experimental allergic encephalomyelitis in inbred mice. J. Immunol. 161:1860. Butterfield, R. J., E. P. Blankenhorn, R. J. Roper, J. F. Zachary, R. W. Doerge, J. Sudweeks, J. Rose, C. Teuscher. 1999. Genetic analysis of disease subtypes and sexual dimorphisms in mouse experimental allergic encephalomyelitis (EAE): relapsing/remitting and monophasic remitting/nonrelapsing EAE are immunogenetically distinct. J. Immunol. 162:3096. Butterfield, R. J., E. P. Blankenhorn, R. J. Roper, J. F. Zachary, R. W. Doerge, C. Teuscher. 2000. Identification of genetic loci controlling the characteristics and severity of brain and spinal cord lesions in experimental allergic encephalomyelitis. Am J Pathol. 157:637. Encinas, J. A., M. B. Lees, R. A. Sobel, C. Symonowicz, H. L. Weiner, C. E. Seidman, J. G. Seidman, V. K. Kuchroo. 2001. Identification of genetic loci associated with paralysis, inflammation and weight loss in mouse experimental autoimmune encephalomyelitis. Int. Immunol. 13:257. Karlsson, J., X. Zhao, I. Lonskaya, M. Neptin, R. Holmdahl, A. Andersson. 2003. Novel quantitative trait loci controlling development of experimental autoimmune encephalomyelitis and proportion of lymphocyte subpopulations. J. Immunol. 170:1019. Iraqi, F., S. J. Clapcott, P. Kumari, C. S. Haley, S. J. Kemp, A. J. Teale. 2000. Fine mapping of trypanosomiasis resistance loci in murine advanced intercross lines. Mamm. Genome 11:645. Wang, X., I. Le Roy, E. Nicodeme, R. Li, R. Wagner, C. Petros, G. A. Churchill, S. Harris, A. Darvasi, J. Kirilovsky, P. L. Roubertoux, B. Paige. 2003. 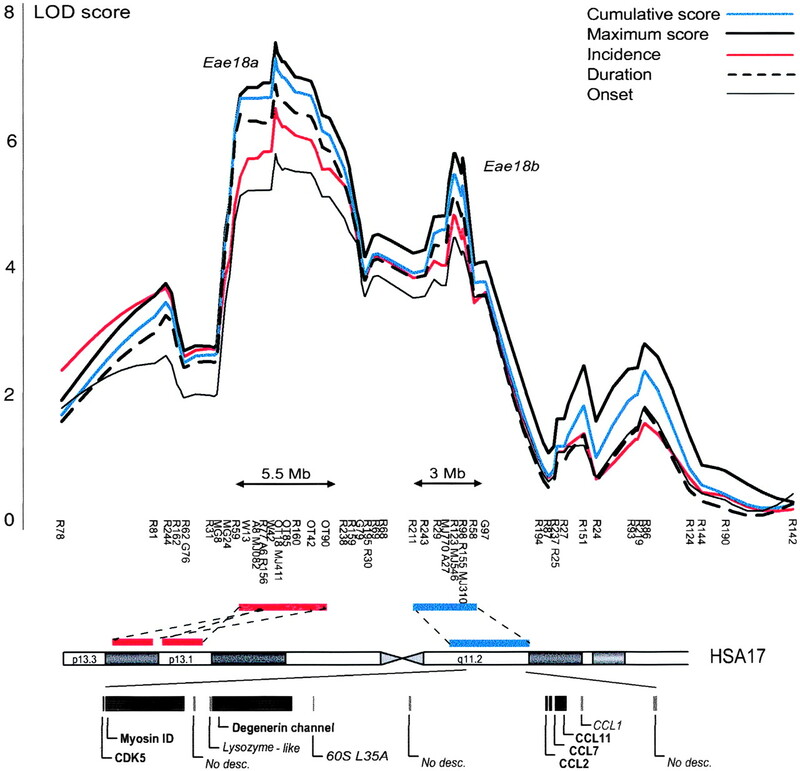 Using advanced intercross lines for high-resolution mapping of HDL cholesterol quantitative trait loci. Genome Res. 13:1654. Mott, R., C. J. Talbot, M. G. Turri, A. C. Collins, J. Flint. 2000. A method for fine mapping quantitative trait loci in outbred animal stocks. Proc. Natl. Acad. Sci. USA 97:12649. Xiong, M., S. W. Guo. 1997. Fine-scale mapping of quantitative trait loci using historical recombinations. Genetics 145:1201. Olofsson, P., J. Holmberg, J. Tordsson, S. Lu, B. Akerstrom, R. Holmdahl. 2003. Positional identification of Ncf1 as a gene that regulates arthritis severity in rats. Nat. Genet. 33:25. Darvasi, A., M. Soller. 1997. A simple method to calculate resolving power and confidence interval of QTL map location. Behav. Genet. 27:125. Jagodic, M., B. Kornek, R. Weissert, H. Lassmann, T. Olsson, I. Dahlman. 2001. Congenic mapping confirms a locus on rat chromosome 10 conferring strong protection against myelin oligodendrocyte glycoprotein-induced experimental autoimmune encephalomyelitis. Immunogenetics 53:410. Amor, S., N. Groome, C. Linington, M. M. Morris, K. Dornmair, M. V. Gardinier, J. M. Matthieu, D. Baker. 1994. Identification of epitopes of myelin oligodendrocyte glycoprotein for the induction of experimental allergic encephalomyelitis in SJL and Biozzi AB/H mice. J. Immunol. 153:4349. Laird, P. W., A. Zijderveld, K. Linders, M. A. Rudnicki, R. Jaenisch, A. Berns. 1991. Simplified mammalian DNA isolation procedure. Nucleic Acids Res. 19:4293. Jacob, H. J., D. M. Brown, R. K. Bunker, M. J. Daly, V. J. Dzau, A. Goodman, G. Koike, V. Kren, T. Kurtz, A. Lernmark, et al 1995. A genetic linkage map of the laboratory rat, Rattus norvegicus. Nat. Genet 9:63. Broman, K. W., H. Wu, S. Sen, G. A. Churchill. 2003. R/qtl: QTL mapping in experimental crosses. Bioinformatics 19:889. Churchill, G. A., R. W. Doerge. 1994. Empirical threshold values for quantitative trait mapping. Genetics 138:963. Lander, E. S., P. Green, J. Abrahamson, A. Barlow, M. J. Daly, S. E. Lincoln, L. Newburg. 1987. MAPMAKER: an interactive computer package for constructing primary genetic linkage maps of experimental and natural populations. Genomics 1:174. Lander, E. S., D. Botstein. 1989. Mapping mendelian factors underlying quantitative traits using RFLP linkage maps. Genetics 121:185. Morel, L., X. H. Tian, B. P. Croker, E. K. Wakeland. 1999. Epistatic modifiers of autoimmunity in a murine model of lupus nephritis. Immunity 11:131. Podolin, P. L., P. Denny, N. Armitage, C. J. Lord, N. J. Hill, E. R. Levy, L. B. Peterson, J. A. Todd, L. S. Wicker, P. A. Lyons. 1998. Localization of two insulin-dependent diabetes (Idd) genes to the Idd10 region on mouse chromosome 3. Mamm. Genome 9:283. Eltayeb, S., D. Sunnemark, A. L. Berg, G. Nordvall, A. Malmberg, H. Lassmann, E. Wallstrom, T. Olsson, A. Ericsson-Dahlstrand. 2003. Effector stage CC chemokine receptor-1 selective antagonism reduces multiple sclerosis-like rat disease. J. Neuroimmunol. 142:75. Elhofy, A., K. J. Kennedy, B. T. Fife, W. J. Karpus. 2002. Regulation of experimental autoimmune encephalomyelitis by chemokines and chemokine receptors. Immunol. Res. 25:167. Teuscher, C., R. J. Butterfield, R. Z. Ma, J. F. Zachary, R. W. Doerge, E. P. Blankenhorn. 1999. Sequence polymorphisms in the chemokines Scya1 (TCA-3), Scya2 (monocyte chemoattractant protein (MCP)-1), and Scya12 (MCP-5) are candidates for eae7, a locus controlling susceptibility to monophasic remitting/nonrelapsing experimental allergic encephalomyelitis. J. Immunol. 163:2262. Fiten, P., K. Vandenbroeck, B. Dubois, E. Van Coillie, I. Nelissen, J. Van Damme, A. Ligers, J. Hillert, M. Andersson, T. Olsson, G. Opdenakker. 1999. Microsatellite polymorphisms in the gene promoter of monocyte chemotactic protein-3 and analysis of the association between monocyte chemotactic protein-3 alleles and multiple sclerosis development. J. Neuroimmunol. 95:195. Nelissen, I., B. Dubois, A. Goris, I. Ronsse, H. Carton, G. Opdenakker. 2002. Gelatinase B, PECAM-1 and MCP-3 gene polymorphisms in Belgian multiple sclerosis. J. Neurol. Sci. 200:43. The Transatlantic Multiple Sclerosis Genetics Cooperative 2001. A meta-analysis of genomic screens in multiple sclerosis. Mult. Scler. 7:3. Remmers, E. F., R. E. Longman, Y. Du, O. H. A. , G. W. Cannon, M. M. Griffiths, R. L. Wilder. 1996. A genome scan localizes five non-MHC loci controlling collagen-induced arthritis in rats. Nat. Genet. 14:82. Lorentzen, J. C., A. Glaser, L. Jacobsson, J. Galli, H. Fakhrairad, L. Klareskog, H. Luthman. 1998. Identification of rat susceptibility loci for adjuvant-oil-induced arthritis. Proc. Natl. Acad. Sci. USA 95:6383. Grattan, M., Q. S. Mi, C. Meagher, T. L. Delovitch. 2002. Congenic mapping of the diabetogenic locus Idd4 to a 5.2-cM region of chromosome 11 in NOD mice: identification of two potential candidate subloci. Diabetes 51:215. Gu, L., A. Weinreb, X. P. Wang, D. J. Zack, J. H. Qiao, R. Weisbart, A. J. Lusis. 1998. Genetic determinants of autoimmune disease and coronary vasculitis in the MRL-lpr/lpr mouse model of systemic lupus erythematosus. J. Immunol. 161:6999. Jawaheer, D., M. F. Seldin, C. I. Amos, W. V. Chen, R. Shigeta, J. Monteiro, M. Kern, L. A. Criswell, S. Albani, J. L. Nelson, et al 2001. A genomewide screen in multiplex rheumatoid arthritis families suggests genetic overlap with other autoimmune diseases. Am. J. Hum. Genet. 68:927. Jawaheer, D., M. F. Seldin, C. I. Amos, W. V. Chen, R. Shigeta, C. Etzel, A. Damle, X. Xiao, D. Chen, R. F. Lum, et al 2003. Screening the genome for rheumatoid arthritis susceptibility genes: a replication study and combined analysis of 512 multicase families. Arthritis Rheum. 48:906. Becker, K. G., R. M. Simon, J. E. Bailey-Wilson, B. Freidlin, W. E. Biddison, H. F. McFarland, J. M. Trent. 1998. Clustering of non-major histocompatibility complex susceptibility candidate loci in human autoimmune diseases. Proc. Natl. Acad. Sci. USA 95:9979.